Barbour Beaufort Waxed Cotton Backpack in Olive Green. 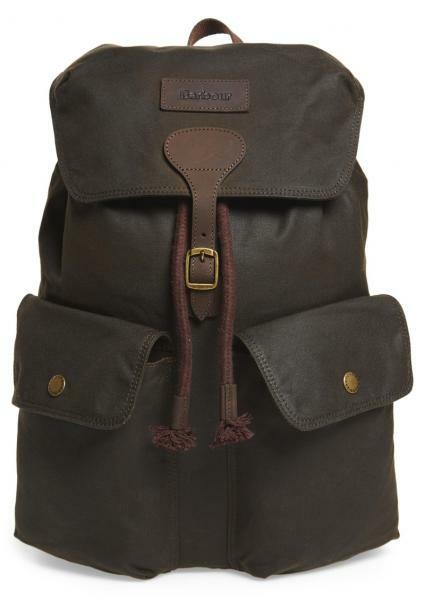 This men's waxed cotton backpack by Barbour has a leather trim to add a touch of refinement to your look. The drawstring and buckle closure add both functional security and style, with large external pockets giving a home to easy-access belongings. The top grab handle and adjustable webbing shoulder straps allow you to carry it in multiple ways, with the interior zip pocket and a laptop sleeve to protect your technology. Available in olive green only as shown.  BACK TO TOP SALE!